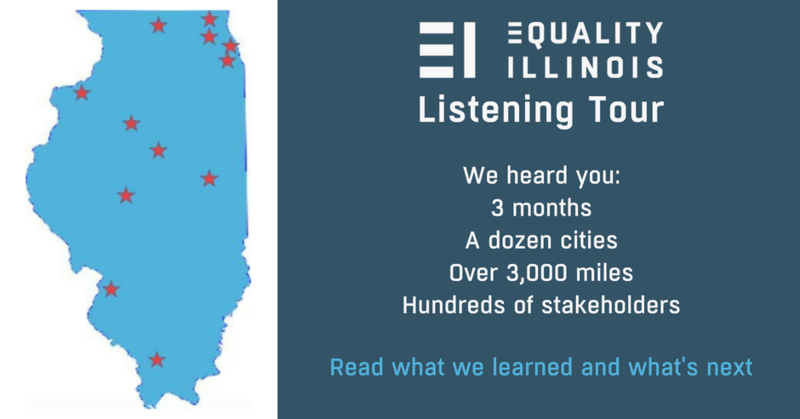 In the first months of the tenure of new Equality Illinois CEO Brian C. Johnson, he’s been on a listening tour throughout Illinois, in big cities, college towns and small hamlets, to listen to LGBTQ stakeholders, to hear your stories, and learn about your hopes and fears for the future. Today, he is publishing his report on what he heard and what Equality is going to do about it. In his report, Brian recounts the concerns over issues such as educational equality, healthcare access, criminal justice fairness, and safety in our communities. And he outlines the beginning steps of how Equality Illinois will address these concerns in the months and years ahead. Please read his detailed report.